Whether it’s bright lights on holiday displays at home or in public, or floors stacked high with food and toys to give to families in need, it only takes a quick look around to see the Southland is dressed up in holiday style. 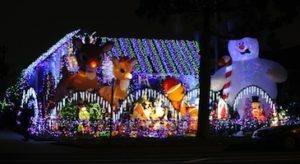 The Winter Wonderland Lights the Night Sky: Countless holiday decorations adorn this glitzy house annually to light up the 300 South block of Gerhart Avenue in East Los Angeles. People come from all over to marvel at this spectacular holiday display. 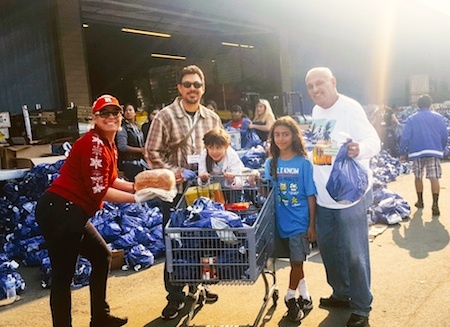 Giving and sharing was the joyful theme at Heart of Compassion’s Christmas Event in Montebello: Over 2,400 people attended Montebello-based Hearts of Compassion holiday food and toy giveaway on Saturday. 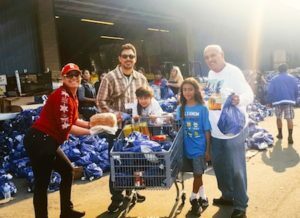 The nonprofit organization recruited more than 200 jolly volunteers to help give out shopping carts full of free groceries, toys, clothes and even Christmas trees to the thousands of families, that included veterans, seniors and children, who showed up in hopes of having a Merry Christmas this year. 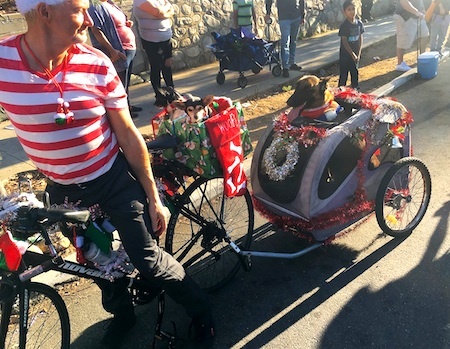 Doggies on Parade in Highland Park: Why walk when you can ride! These two canine friends and their owner were a big hit as they made their way down Figueroa Street during the recent Northeast Los Angeles Holiday Parade. Santa’s Toyshop Moves Into Estrada Courts: Assemblyman Miguel Santiago (D-51) joined Santa at the Boys and Girls Club at Estrada Courts in East Los Angeles Saturday for some holiday cheer that included a variety of fun games, foods and toy giveaways.